December Roundup: What Does Ambition Look Like in Quality? The word “ambition” can be a loaded one. To some, ambition means striving above and beyond for excellence. To others, ambition can mean overstepping defined goals or boundaries. 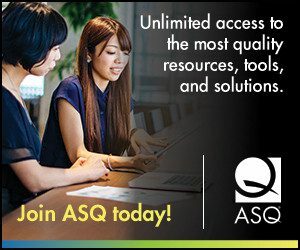 In December, ASQ’s Influential Voices bloggers talked about what ambition means to quality. Not surprisingly, this became a somewhat contentious topic among the group. Does quality need more ambition, or is ambition the wrong goal for the field? Which side do you take? Pursuing ambition: Pam Schodt writes about how to encourage the quality message at work. Quality thinking is not just about ambition–it could be the key to putting all aspects of a business together, says Luciana Paulise. Babette Ten Haken encourages us to have an ambitious conversation about quality. Rajan Thiyagarajan talks of importance of collaboration when pursuing quality ambitions. John Priebe writes that ambition means solving problems. Lotto Lai writes about what ambition means to quality organizations in Asia. Tim McMahon says that an organization’s executives must have high ambitions for quality before we an ask for ambition in others. And Edwin Garro looks to the famous Latin American comic strip “Mafalda” for a lesson in quality and ambition. Quality lacks ambition: Sunil Kaushik argues that quality isn’t ambitious beyond the scope of a particular project. Manu Vora agrees, listing ways that quality can improve. Quality on the whole is not ambitious enough, and that’s fine, argues Anshuman Tiwari. What do we mean by ambition? Michael Noble reflects on the definition of quality put forth in Robert Pirsig’s cult classic novel Zen and the Art of Motorcycle Maintenance. Dan Zrymiak has an epiphany of value, purpose, and function in terms of quality. John Hunter looks to Deming to define and set goals for ambition. Nicole Radziwill responds by discussing Deming’s 14 points in a different context. To Bob Mitchell, ambition means that “we must increase our agility, become ‘comfortable being uncomfortable,’ and think globally in today’s flattened world.” To Jennifer Stepniowski, ambition in quality is more of a matter of marketing quality, a challenge that she addresses in her post. Scott Rutherford finds the original question misplaced, arguing that quality is expectation, not ambition. And Jimena Calfa writes that ambition in quality must be a passion for quality on the part of the individual. To some, being ambicious is to take calculated risk in order to achieve the quality. I think of ambition as the human drive to get somewhere in society or in one’s life, as opposed to a characteristic of quality. My dictionary says ambition is “an ardent desire for rank, fame or power” and “a desire to achieve a particular end”. I think we have ambition for success, and for recognition in our fields, as part of our human nature. We can have ambition to be effective leaders, and to promote quality if that’s where our ambitions lie. But that’s a personal matter, not part of the concept of quality itself. I do think capitalism should be redefined. Previous Previous post: November Roundup: What Does Leadership Mean to Quality?